The MD7-Pro system can be efficiently expanded by daisy-chaining Acquisition Nodes. Measuring 50 x 40 x 5 mm with a mass of 20 g, the Acquisition Node is a direct replacement for traditional instrumentation such as rack-mounted oscilloscopes and function generators, enabling distributed data acquisition and signal processing. Each Acquisition Node provides a 20 Vpp 20 MSample/sec arbitrary function generator, 6 independent 12-bit channels of up to 50 MSamples/sec with programmable gain up to 500 or attenuation down to 1/500 in addition to 2 Gbit of DDR3 memory. The nodes are potted in urethane to provide resistance to moisture, chemicals, flame and shock loading, and have been designed to pass aerospace EMI standards. The Acquisition Nodes are capable of facilitating high sampling rate damage detection methods (guided wave, acoustic emission, and frequency response) or collecting multiple external pre-conditioned differential voltage sensor signals (strain, humidity, temperature, acceleration, etc). In-service monitoring techniques utilize a dense web of analog sensors connected by individual wires routed to centralized data acquisition and processing units. This traditional approach carries a significant weight penalty, can be complex to instrument and is susceptible to EMI. To address these issues, MDC has developed a fully digital SHM solution. The MD7-Pro system is composed of 3 core elements: an Accumulation Node for remote data concentration and diagnostic processing, an Acquisition Node for distributed signal digitization, and analog sensor bases that mate with both types of nodes. Each element of the MD7-Pro system is networked on an 10-wire serial bus that carries command, data download, node synchronization and power. Benefits of this distributed infrastructure approach include higher fidelity data through digitizing sensor signals at the point of measurement, reduced computational burden through local signal processing and feature reduction, and overall minimal mass through the consolidation of cables and elimination of bulky centralized hardware. The MD7-Pro System has been flight tested on fixed-wing aircraft, rotorcraft and spacecraft. The Accumulation Node is the first element placed at the front of any MD7-Pro bus. Measuring 60 x 40 x 5 mm with a mass of 25 g, the fundamental role of the Accumulation Node is to serve as an interface between the SHM network and the platform being monitored. It accepts 28VDC to distribute power for 24-254 daisy-chained Acquisition Nodes in a MD7-Pro network, along with relaying commands, facilitating synchronization, and storage of the resulting data. It can be programmed to run autonomously, communicate over Ethernet, or accommodate flexible provisions for other wired and wireless protocol. In addition, the Accumulation Node offers 16 digital input channels and provides 8-GB of static memory. A powerful FPGA with an ARM core processor can be programmed to execute embedded diagnostic algorithms or prognostic and health management (PHM) logic. 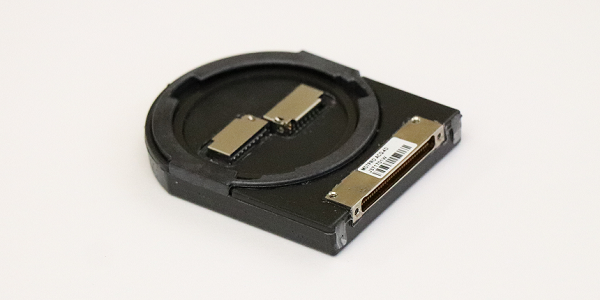 The MD7-Pro Acquisition node can accept a large range of appropriately configured sensor bases, which not only provide a mounting interface to the structure, but provide a physical connection to the external analog and/or digital sensors being monitored. Traditional SHM methods require dense sensor meshes to precisely resolve the position of damage, however this drives up system weight and complexity. Thus, in addition to customer specified custom configurations, MDC has patented a standard PZT beamforming array package to facilitate both active and passive structural sonar scans. The Structural Sonar Array can indicate damage event coordinates using a novel sensor design along with an innovative algorithm with minimal information about the material or structure. From a single node position, a probability of damage map can be generated in response stiffness changes detected by an active guided wave scan, or due to the passively captured acoustic response from an impact event. Results from multiple nodes can be combined synchronously and/or asynchronously to enhance sensitivity and resolution.